An oily-looking, auburn liquid drips off a turning gear wheel, fills the gaps between the cogs, and then creates fierce splashes. In another video, blue liquid flows into a container. When it reaches the tight outlet, it creates swirls that keep expanding. These vivid depictions of flow behaviour were published online by the Berlin-based dive solutions GmbH, which was founded in June 2018. Based on simulations, these videos are created using novel algorithms, operating on the assumption that currents can be viewed as an interplay of particles. ‘Put more simply, try to imagine that particles interact with each other based on physical laws,’ says Maik Störmer, who is one of four founders. Conceived this way, flow behaviour can be captured simpler, quicker and more precise than traditional software. ‘It really has its limits in complex systems, for example, when water and solids mix, or when you add rotating components,’ says Störmer. The demand for flow behaviour simulations is high in fields like machine engineering, process technology, and water management. A common example are wastewater systems, where deposition of solids is widespread. How must the systems be designed to prevent congestion and save water? Using these new algorithms, calculations replace the elaborate on-site experiments or model experiments. ‘Our main focus is on hydrodynamics,’ says Störmer. However, the industrial engineer also sees a lot of potential for aerodynamics in, for example, the auto and aerospace industry. While developing algorithms is not an easy feat, using them should be as simple as possible. This is a guiding principle for the four founders, who, in addition to Störmer, include the physical engineers, Pierre Sabrowski und Johannes Gutekunst, and Felix Pause, an aerospace engineer. No one should have to be a simulation specialist to use dive’s cloud-based software. Currently, dive’s services are designed for other businesses, but, as Störmer says, it could soon be available for private use in, say, modelmaking. For now, it’s all about establishing the company on the market. Considering the development so far, the dive quartet is optimistic. Starting in October 2017, their new business was helped along by a grant from EXIST, the business promotion programme of the Federal Economic Ministry. They were also successful at the Business Plan Competition Berlin-Brandenburg. Lastly, the young entrepreneurs gave a convincing presentation at this year’s ‘A2 Adlershof Accelerator Smart City”, hosted by WISTA Management GmbH, where they were able to win over the Berliner Wasserbetriebe, Berlin’s public water supplier, for a pilot project. ‘We simulated a culvert, a pipe structure underneath a road,’ says Strömer. The aim is to direct the sediment-laden water in a way that prevents residue. ‘The five-month A² programme also features professional coaching and access to networks and contacts,’ says Yvonne Plaschnick, the accelerator’s project manager. 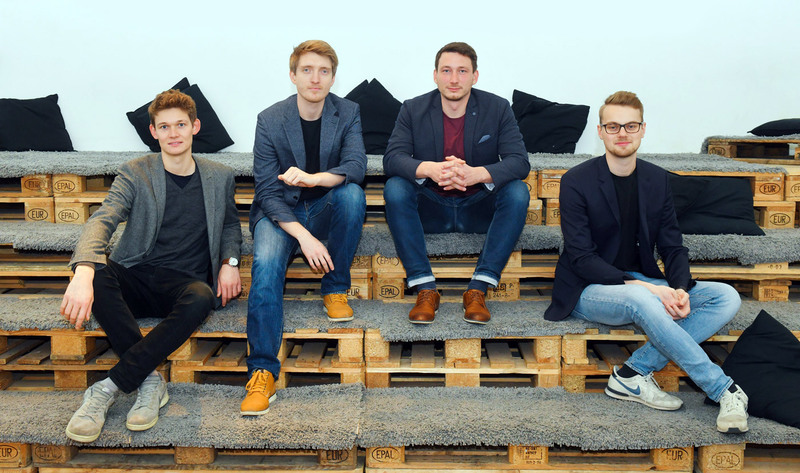 This was a very important feature for the founders of dive, as was the free-of-charge office space at the hip co-working space ‘The Place’ in Berlin-Mitte, sponsored by the Berliner Sparkasse, which they share with other young entrepreneurs. The next step, according to Störmer, is an office of their own. Possibly in Adlershof, but most definitely in Berlin.